Scaling may be considered an extension of measurement. Scaling involves creating a continuum upon which measured objects are located. 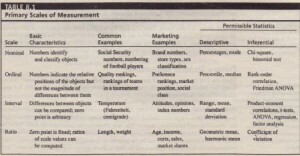 To illustrate, consider a scale from 1 to 100 for locating consumers according to the characteristic “attitude toward department stores.” Each respondent is assigned a number from I to 100 indicating the degree of (un) favorableness, with 1 = extremely unfavorable, and 100 = extremely favorable. 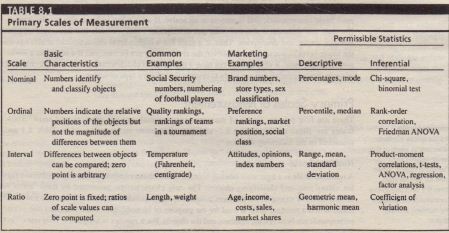 Measurement is the actual assignment of a number from 1 to 100 to each respondent. Scaling is the process of placing the respondents on a continuum with respect to their attitude toward department stores. In the opening example of most admired companies, the assignment of numbers to reflect the annual revenue was an example of measurement. The placement of individual companies on the annual revenue continuum was scaling. The characteristic of distance means that absolute differences between the scale descriptors are known and may be expressed in units. A five-person household has one person more than a fourperson household. which in turn has one person more than a three-person household. Thus. the following scale possesses the distance characteristic. 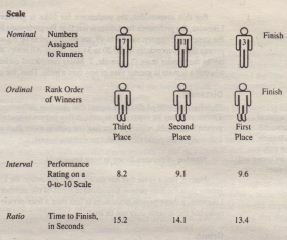 When used for classification purposes, the nominally scaled numbers serve as labels for classes or categories. For example, you might classify the control group as group I and the experimental group as group 2. The classes are mutually exclusive and collectively exhaustive. The objects in each class are viewed as equivalent with respect to the characteristic represented by the nominal number. All objects in the same class have the same number and no two classes have the same number. 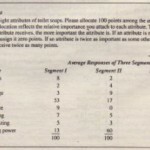 However, a nominal scale need not involve the assignment of numbers; alphabets or symbols could be assigned as well. In the opening example, alphabets were assigned to denote specific companies.